Posted on July 28, 2015 July 28, 2015 Categories EDM, HTML, HTML EmailsTags EDM, forms, HTML Emails, newslettersLeave a comment on Can I put HTML Forms in Emails? I love IE Conditional Comments… said no one ever! Although it’s considered bad practice, sometimes we are left with no choice but to use IE conditional comments. Maintaining IE specific stylesheets can be a pain, especially for the scenario I’ve mentioned above like splitting up your CSS purely for IE. This can easily be solved by using grunt to compile your CSS into separate files. One thing to note though that the condition comment for non IE browsers is a slightly different syntax! Posted on July 20, 2015 July 28, 2015 Categories CSSTags conditional statements, ie, stylesheet limitsLeave a comment on I love IE Conditional Comments… said no one ever! 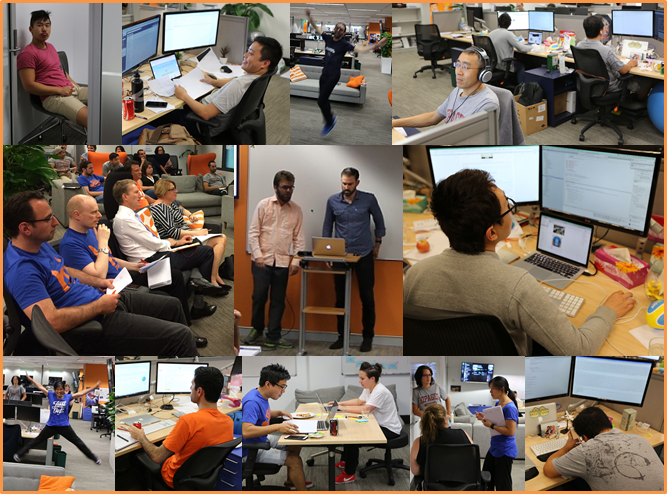 HipagesGroup held their very first hackathon a few days ago and it was extremely exciting. This hackathon is slightly different to any other hackathon – it has a twist. We have combined concepts from SharkTank into our hackathaon where the company invited some of the board members to be the advisers and judges for the event. We presented our ‘business’ idea of what we would like to build in front of the board members on the first day where they gave us advice based on their expertise. We had 48 hours to complete the project and present it back to the board members. The race is on! I teamed up with 3 others to get out Oracles, a NLP (natural language processing) classifier and an image recognition classifier built in AngularJS and Ionic framework, an open source front-end SDK for developing hybrid mobile apps with HTML5. It was my first time using the ionic framework but it was absolutely easy to use – I would truly recommend anyone who hasn’t checked out Ionic to have a try. We loaded our data into Metamind.io, to build our classifier, based on deep learning algorithms. As for our image recognition classifier, we used the CloudSight API. Although we didn’t win as a team, I was extremely humbled to be announced the winner of the Inaugural Above and Beyond Award by our VP of Engineering and VP of Product. HipagesGroup has recently introduced OKRs through all the departments. OKR (Objectives and Key Results) is exactly what it stands for: Objectives – goals that tell you where to go and Key Results – indicate how you will get to your goal for each objective. Our company OKR has been closely linked to Growth. I was very privileged to be assigned into the Growth focus team where we created a CRO (Conversion Rate Optimization) pod consisting of our VP of Product, a product manager, myself and another developer. Our aim is to push out two CRO A/B tests a day and in the last few weeks, I am beginning to really appreciate and understand what Growth Hacking is all about. Once you get familiar with the process and deploy a few tests, it can get quite addictive. After the last few weeks, I find myself chasing those test results, wanting to know whether the tests we rolled out have moved the needle. The results for one of our CRO tests, aimed for the increase in mobile traffic, show that we have raised the conversion rate from 3% to 6% – that is a whopping 3% increase in conversions! CRO has now become one of my passions! Feel free to drop me a line if you have any questions or would like to discuss anything CRO. Our VP of Product, Dino Talic has recommended reading ConversionXL, Extra Lucrative Conversion Advice. There are some very good articles there on CRO, one of my favourite being “How to Recognize Great Conversion Optimization People“. A handy tip I got taught was to look at the built-in helpers for handlebars in the git and write your own based of theirs as a starting point. After diving into backbone last month, I thought it’s time to have a look at AngularJS. What’s the hype with AngularJS? Why is it a popular choice for large scale websites? I often ask people at meet-ups whether their company uses Backbone, Ember and/or Angular and quite a few people usually reply with ‘Angular’. My next question usually would be why they have decided to choose AngularJS and majority of the responses is that AngularJS is backed by Google and that there is a wider support and documentation. One of the first observations I made when I first started looking into Angular was the statement on the AngularJS website; “AngularJS is what HTML would have been” – that’s a pretty strong and bold statement! AngularJS allows you to ‘extend’ the HTML vocabulary. You can set your own ‘directives‘; custom attributes and elements. The ng-app attribute in the html tag above is an example of a directive which is used to auto-boostrap the application. This is commonly forgotten by beginners. The two way data binding in Angular is extremely powerful and simple – it’s automatic synchronisation! When the model changes, so does the view. The Code School “AngularJS Tutorial for Beginners” is also a great way to get an insight of what it’s like to code in Angular. There are still lots to learn in AngularJS – will definitely write more as I dive deeper… stay tuned! Posted on September 24, 2014 October 10, 2014 Categories engineering dept, hipagesTags devs, Engineering Dept, hipages, t-shirt swagger, teamLeave a comment on hipages Engineering Dept Tees!